How many times have you made either cushions for your outdoor furniture or raincoats for yourself or your family — THOUGHT all was well, until water somehow got in through the seams? I guess on the raincoat seams, the little bit of water that got inside would dry, but it could also cause a little problem being wet at the seams. The patio furniture cushions is a different story — once water gets inside, the cushion itself or stuffing that you’ve used would most likely stay damp long enough to perhaps turn mildewey, or deteriate the stuffing materials. Dawn at Two On Two Off Blogspot has done a fantastic scientific research test (she’s a science teacher) on the various products that claim to waterproof even the seams. This looks like it was a very involved experiment – time consuming to say the least. 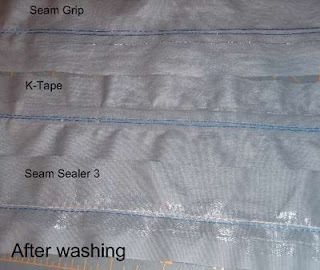 The above picture shows the “after washing” of the different seam sealer products that she used. You need to visit her blog, listed above, and read about how she completed the test of products and her final opinion of the products. I, personally, would like to thank Dawn for doing this work for us, and passing it along through her blog. 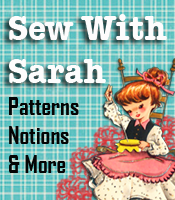 This is great information for all of us who do any type of sewing that could use some “seam” sealing to complete the water proofing project.